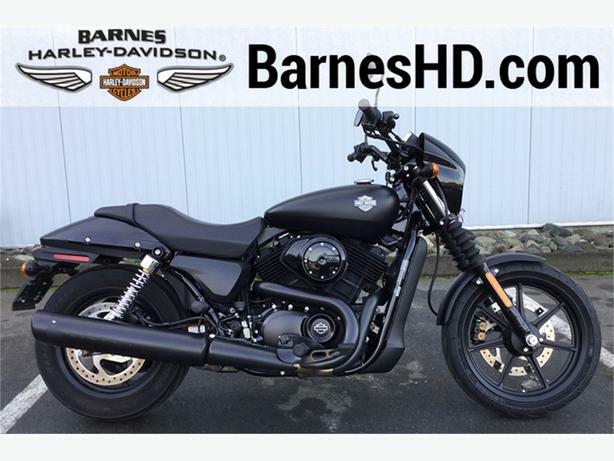 Take on the urban grid with 500cc of easy-handling, blacked-out Harley-Davidson® Dark Custom(TM) style.A hot night on the town never felt better. The action goes from stoplight to stoplight, boulevard to back alley. At the center of it all you carve through heat, chaos and gridlock with ease. You get a liquid-cooled Revolution X(TM) engine loaded with torque and built to thrive in stop and go traffic. A light frame with an easy lock-to-lock handlebar sweep for quick moves. And dark styling details like blacked out pipes, café-style windscreen and fork gaiters to put the edge on the look. Got any plans for the evening? We were all warned as kids about playing in the street. If you're the sort who never listened to a word of it, we've got your motorcycle. The street is where the action is. The Harley-Davidson Street® series is a line of bikes built with one purpose in mind: to make the most of it. Every inch of the motorcycle has been thought through to meet the demands of navigating the urban landscape. A narrow and nimble profile with a tight 60.4-inch wheelbase keeps the handling razor sharp. Quick moves and turns come easy when you're threading through whatever modern civilization decides to throw in your path. You have liquid cooling. You have loads of power in the Revolution X(TM) engine, for when you need to be somewhere else in a hurry. We're talking about a whole different kind of two-wheeled animal here. One born to take on the traffic-snarled urban jungle.